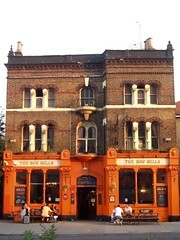 A pub in Bow, on Bow Road, near Bow Public Hall. A decent venue, it has a jukebox and a pool table. They have a selection of lagers and ales, and the staff are friendly. They serve food until 6pm, except when there are football matches. Verdict: Chuck lives in the area and it's an OK place to go and play pool, but wouldn't call it my favorite. Last visited by Chuck, 6 April 2009. Last edited 2013-05-10 06:48:26 (version 6; diff). List all versions. Page last edited 2013-05-10 06:48:26 (version 6).